This freebie includes a festive instruction sheet and printable stationary (ruled lines for both primary and intermediate included). Thanksgiving is a wonderful time to give thanks for the people, moments and gifts in our lives that we sometimes overlook. 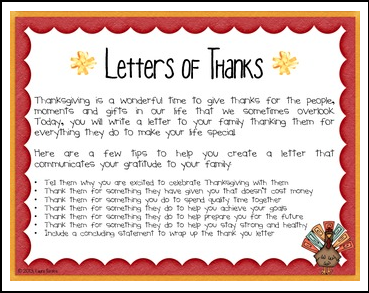 This activity guides students to write a letter to their family thanking them for everything they do to make life special. The instruction sheet guides students to focus on thanking their family for non materialistic items and activities as well as things their family does to promote success, happiness and health. These letters can be sent home with students to share as a gift with their families on Thanksgiving Day. Your classroom will be filled with the warmth of gratitude and your heart will be filled with joy as you read the thoughtful notes written by your students each year.